Support your dog’s physical and mental wellbeing with Vet's Best Multi-Vitamin Soft Chews Supplements. Our great tasting, extra moist daily chews have the essential vitamins and minerals (including vitamin B complex, vitamin A, vitamin D, selenium and zinc) your dog needs each day. This veterinarian-formulated supplement also contains OptiLife3™, which provides antioxidants and prebiotics to reduce the effects of normal environmental stress, support a healthy immune system and digestive health. 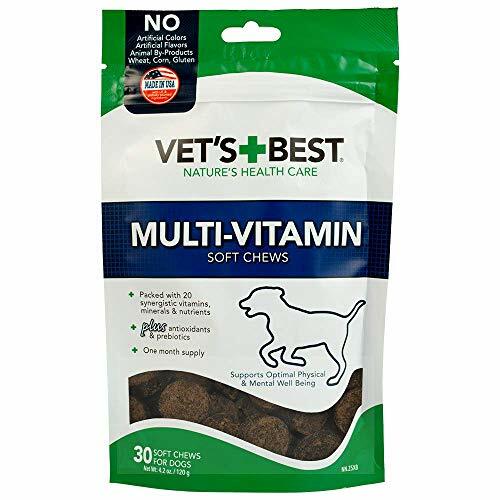 A HEALTHY FOUNDATION - Vet's Best Multi-Vitamin Soft Chews (30 count) contribute to your dog's long-term active and healthy lifestyle by combining 20 synergistic nutrients. ONCE-A-DAY - Densely packed with active ingredients providing a high level of bioavailability for optimal absorption, our Multi-Vitamin Soft Chews give you the ease and simplicity of a once-a-day supplement. VETERINARIAN-FORMULATED - Each soft chew contains a blend of essential vitamins, minerals, and nutrients to promote your dog's wellbeing. NATURAL ALTERNATIVE - Our OptiLife3 formula, made with natural ocean kelp, provides antioxidants and prebiotics to reduce the effects of normal environmental stress, support a healthy immune system and digestive health. APPROVED - Carries the National Animal Supplement Council (NASC) Seal of Approval. If you have any questions about this product by Vet's Best, contact us by completing and submitting the form below. If you are looking for a specif part number, please include it with your message.